There are strong feelings being expressed about church architecture today. It is my hope in writing these articles that the reader will feel empowered to think for himself and not feel obligated to follow directions established by art and architectural historians who intentionally and sometimes unintentionally use their ‘special’ language and terminology to make the reader feel small and unqualified to express his own thoughts and opinions on the subject. Often these historians support their arguments with Catholic doctrine and even cite the Gospels, but invariably there is a clear disconnect between their references and the conclusions they draw. Something in your gut tells you something doesn’t ‘smell’ ‘right. They make their case eloquently, and so many feel it is impossible to argue with them. We can change this based upon an understanding of Catholic teaching as it applies to the design arts. One of the goals of these articles is to explain what happens in these schools and why it isn’t necessary to depend upon others to understand what buildings are all about, whether historic or contemporary. Bad architecture is bad architecture—period. Moreover, you will learn something about what makes buildings good and sometimes great. My hope is that the reader will feel finally liberated from a sort of intellectual tyranny, that the reader will feel capable of analyzing buildings for himself and contribute to the design of better buildings, especially ecclesiastical ones. My degrees in architecture come from the University of Florida, Pratt Institute and a year spent at the University of Florence in Italy, reading original documents and consulting descendants of those artists and architects. I took all of the required courses in architectural history that every student of architecture takes. With all due respect, professors of history are not known for their creativity or original thinking. These are the professors who are responsible for reviving neoclassicism; our should I say ‘neo-neo-classicism,’ since it’s been resuscitated so many times, as Archbishop Betori of Florence, Italy, has pointed out. Problems begin for architectural students in their history courses which are invariably taught from a secular and outsider’s perspective. Here’s History 101 in a nutshell. Courses often begin in Mesopotamia, then move on to Egypt, and finally wind up in Greece. Greek civilization is put on a pedestal that is justified in one sense, but in the most important sense, is not. Just to be clear—no one is blaming the Greeks, but their architecture is no more sacred than anyone else’s. I will expand upon this in subsequent articles. Before I forget, you might study the Mayans and Aztecs, but rarely are they presented to be in the league of the Greeks. Why? Consider the following: The Greeks and Romans won the marketing war in the western world. And winning wars is important. The winners write history. Ancient Greece was unquestionably a great civilization, but let’s put things in a global context. Prior to Marco Polo, few had any knowledge of the East. So regardless of how great the art and architecture of the East was and is, it was generally discounted as being of equal importance for hundreds of years; and in the mind of the neoclassicists or ‘traditionalists’ (and you will see later there really isn’t much difference, they’re splitting hairs when they say there is), it has no importance. So if readers from China, India, and Russia don’t already feel alienated (to mention only a few), it will become clear why it is unjustifiable to continue to copy works of architecture from Florence, Italy, and the surrounding area when we live in overwhelmingly pluralistic society. Unquestionably, a lot has to do with language. Language is what enables us to communicate. But don’t minimize the importance of this obvious statement. Language and the use of language is how marketing wars are won, and believe me, those that consider themselves ‘traditionalists’ are in a marketing war. Let’s start by defining the word “traditionalist.” Is the person who copies works from the past a true traditionalist? Is the person who relies on mimicking forms and rehashing architectural details from one period of time, long ago, an innovator? It’s time for a “emperor’s new clothes” moment. We need to state the obvious. The person who copies is called a plagiarist. He or she does not deserve to be considered truly respectful of tradition (more on tradition later). The Catholic Church tells us we have a moral responsibility to innovate. Cultures that don’t innovate die. The Church is in a constant state of renewal, and it should be, whether we like it or not; that is reality. To the logical, rational thinking person, this comes as no surprise. In subsequent articles we will also define what it means to innovate from the perspective of Catholic morality. The crisis in church architecture is not a stylistic one; it’s a moral one. And it is not exclusively the fault of the modernist, who has his or her own problems. The neo-neo classicist, and/or false traditionalist, will often fall back on accusing architects whose approach to architecture is not strictly rooted in historic representations as being victims of the “Zeitgeist” (spirit of the day), as if everyone is “infected” by it. Instead, it reflects a deeper cultural crisis. Don’t doubt it for a second. It reflects the objectification of parts—parts of products and machines, parts of buildings, and parts of the HUMAN BODY. This evil has no stylistic limitations. The real culprit is this objectification. It affects practically everything around us and is the work of the evil one and not only limited to the realm of pornographers. It greatly saddens us all to know that this fascination with objectification has affected the clergy as well. If we are successful, the next time you sit on a church building committee, you will have confidence to confront the false traditionalist, modernist or whatever kind of architect you happen to have in front of you. Your culture and your traditions are as important as anyone else’s. Everyone has something meaningful to contribute. So long as the Architecture of a Church maintains the more ancient/medieval form, both on the Exterior and Interior, but especially the Exterior I am happy. The abstract architecture of post-modernism is suggestive that there is no order and transcendental, but rather disorder, disharmony, we cannot have our architecture and the other various modes of expression, be in alignment with Post-Modern thought, because Post-Modernity is hostile to Christian Truth. Not to mention the fact that Post-Modern Architecture made its first real debut in socialist/communist Russia, I couldn’t see how trying to adapt the architectural style of a profound enemy of Christian Truth would ever be feasible, let alone acceptable. Frank Lloyd Wright’s architecture certainly wasn’t “abstract”. 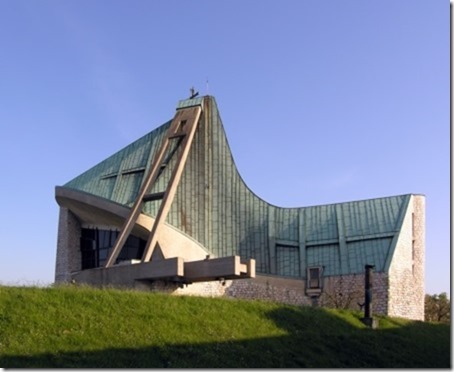 And neither is the architecture of Giovanni Michelucci, who designed the Church shown above. To design a Church that doesn’t mimic older forms does not mean that it automatically aligns with socialist/communist Russia or is expressive of “post-modernism.” In fact, why not imitate the great Russian Church architecture, or the Syrian, Coptic or Indian … which have roots that are just as ancient? That’s the point of the article. Instead of developing architecture that is truly inclusive and expressive of all members of a given Parish, the neo-neo classicists are simply copying what they like without deference to those who actually have to pray in that space. They’re are not listening, they are imposing. Successful architecture of 500 years ago is forced upon someone who comes from and lives in an entirely different culture. It is easy to become enamored with the forms of western European medieval architecture for the beauty of its surface treatment, without looking below the surface to the more important aspects of the building … which has to do with the space and how it is defined and how it addresses the needs (i.e. functional and spiritual), of people today; independent of any style. Curious to see where you’re going with this. I used to think folks who copied from the past were “plagiarists” as well. You know, that hipster trope dismissing all that is not original lacks some value. However, I’ve realized that “innovation” _qua_ “presenting something truly unique” is the rarest sort of work – and almost always an accidental discovery, tripped over without purpose, and appreciated for it’s own value, not the quality of its discoverer’s intellect. Anything else, and that includes the vast majority of human creativity, seems to be a remix. To assert otherwise seems to grant God-like powers of creativity to us contingent beings, something Bl. John Paul II warned about in his _Letter to Artists_. This is pretty much how I see it as well Paul. Only God creates, except when we are co-creators in bringing about a new human life. That’s it. The rest is, as you say, a discovery process, where we dis-cover … un-cover what God already created. But it is not about a remix … or it shouldn’t be. Because a remix is focusing on the elements, rather than on the underlying cultural, intellectual and spiritual motivations that change from one period of time to another and ultimately determine the form, shape and details of a building. More about this in subsequent articles. wow…ignorance AND arrogance from this author! “professors of history aren’t known for their original thinking….” Yikes. And what have the Modernists given us? The built form of Cartesian, Kantian secular thinking. They don’t know the first thing about sacramental theology, so they try to woo us with smooth talk about honesty of materials and how glass, steel and concrete are the only materials true to our time. This is simply rubbish regurgitated from architecture schools like Pratt and the University of Florida, where people have been regurgitating Le Corbusier’s flimsy writings and abysmal churches for 80 years. And historians aren’t known for their original thinking! Sheesh! Tell an architect or officer of the AIA that he has to disown the Zeitgeist model and then see how much original thinking goes on! He’d be like a news anchor without a cue card. The truth is that designing compelling architecture in traditional modes is rigorous, demanding and requires knowledge they don’t have and skill they will never have. And so they call it “modernized this” or “of our time that,” when really what they parade is self-willed trash based on the flimsiest philosophical principles regurgitated through three generations of dim-witted architecture professors who can’t read. And for some reason, well-intentioned Christians pay for it. Even worse they pay for strip mall classical by Modernist architects who should know better than parade their ignorance of how to proportion a column and design an entablature. And they have absolutely no knowledge of sacramental theology. Catholic churches in particular are intended to be sacraments of the new heaven and the new earth. And there is no imperative to innovate…any more than there is the imperative to innovate a new moral theology or Eucharistic prayer. The primary purpose of tradition is to hand on, not invent. Every age finds it’s way to do it, but all things Catholic are fundamentally concerned with passing on the truth. Moreover, traditional architecture does not objectify body parts. Sheesh again! It finds the patterns of nature in proportions and methods and draws out principles which are then applied to architecture because nature reveals the mind of God. Catholic Lane ought to do better than allow someone with such little knowledge to write on its blog. Hello James … excuse me for my delay in responding. I clearly hit a nerve. Your comments are quite typical of the false traditionalist who is lost in a nostalgic understanding of architecture. As you did, they throw words around like “zeitgeist” and classify anyone who isn’t plagiarizing classical works as a ‘modernist’. I’m not a modernist … and many architects today are not modernists, or post-modernists, etc., etc. But of course anyone who isn’t mimicking the works of architects that have been dead for 500 years or more, must be a ‘modernist’. With regards to education; Your comments regarding my education are simply the sad insults of someone who doesn’t know what else to say. The University of Florida and Pratt Institute are solid schools. Their technology courses are as good as any in the U.S. Knowledge of structures and technology is important and undeniable. Do tell … what are the great bastions of enlightenment in the field of architecture in this country? There is a moral obligation to capitalize on technological innovations. Our faith teaches us this. After all, even the classicists did that. But it was precisely because these schools did not effectively address the issues we are discussing here that I enrolled in the Italian school of architecture, in Florence, more than 30 years ago; a fact your conveniently ignored. BTW … there were no other Americans in the University of Florence at that time. This afforded me the opportunity to access the archives and enter buildings that an American like yourself could never access, unless you too were enrolled. The vast knowledge of the past that you claim to have is based upon truly regurgitated information, often mediocre translations of important works. I don’t mean this as an insult. So please don’t take it as such. Those of us who studied architecture in the U.S. were all victims of this. Hence my going to Italy. I too read the works the phony traditionalists hold up as ‘gospel’ … but I read them in their original language. It makes a difference. I studied these buildings first hand with commentaries (e.g. Mannetti su Brunelleschi) by their contemporaries. I did this for the better part of ten years in Italy. So the accusation of ignorance and arrogance is clearly out of line and would appear to reflect your great frustration and insecurity on the subject. When it comes to passing on truth, doing so does not mean merely trying to resuscitate the dead as Cardinal Betori put it when referring to the vincible ignorance (or perhaps it is invincible ignorance), of the neo-neo classicists by merely perpetuating the false notion that people today have absolutely nothing to contribute to the living faith. So all of the ‘smart people’, lived 500 years ago, and the best we can do is emulate them? Pure nonsense. I applaud you for taking the time to express your feelings, even though they appear to be the rants of a frustrated theorist. It appears that you do indeed have some theoretical knowledge on the subject. What would the false traditionalist do if they were to recognize the truth about themselves and their understanding of architecture. Well, they would do as Michelucci did, and which I wrote of in a subsequent article. It happened to me and countless others. They would go into a crisis. Yes, what I learned and didn’t learn at the University of Florida put me in a crisis. It took years to undo much of the confusion that was created there. So to this extent, I agree with James. But the answer is not to bury oneself in a false understanding of the past in order to acquire knowledge on the subject that is not in opposition to our faith. It’s an easy trap and many fall into it. Created in the image and likeness of God, we are created to discover and explore the valuable applications of God’s eternal truth which is revealed to us over time. We know that the Greeks and Romans didn’t discover it all. More importantly, let’s not forget, they were pagans. Also, as Alberti pointed out, there is a moral imperative to use the vernacular. As one of the false traditionalists’ heroes, why is this conveniently ignored. How do they answer this? They don’t. They can’t. If they accepted it, they would be lost. I had the good fortune of inheriting all of the books of a Priest from his years at the seminary; Holy Apostles seminary. A really solid seminary. And I read them. So the claim that anyone who doesn’t adhere to the erroneous nostalgic view of architecture, that you say is rooted in ignorance of sacramental theology, is simply another generalization to comfort yourself in your heterodox position. There are many of us who have considerable knowledge of sacramental theology. It is truly a reflection of arrogance to assume otherwise. I would also welcome an opportunity debate you in a public forum on the subject at anytime.